Can you imagine writing a text book that would become the most important textbook in a key subject for over two thousand years? Euclid (of Alexandria, fl.c. 300 BC) did! He had access to the works of other geometricians who had lived before him and decided to compile them into one complete volume where every theorem, every step, logically followed from the previous ones … and that everything, the entire edifice, would be built on just 23 definitions, 5 unproved postulates/axioms, and 5 common notions (unproved assumptions). His Elements was so thorough and marvellous a work that it remained the main text for teaching mathematics (geometry in particular) until the early 20th century. The first books in his Elements deal with geometry; the later ones deal with topics such as ratios and number theory. His proof of Pythagoras’ Theorem (the 47th Proposition in Book 1 of the Elements) is possibly the most famous theorem in Euclidean geometry. His proof (in Greek) is shown at left and you find a wonderful discussion of the Greek text at J B Calvert’s Page. I have a book in my possession, The Pythagorean Proposition by Elisha Scott Loomis, which contains (as I count them) 353 different proofs of this theorem … one of them by President James A Garfield of the USA in 1876. A number of ancient cultures (Babylonian, Chinese, Indian and possibly Mayan) had discovered a relationship between the sides of right-angled triangles. This allowed them to construct right angles with ease (in Egypt, they used knotted ropes) and to calculate the diagonal distance across objects! These skills were known by the Babylonians probably as early as 1500 BC and were very useful skills for surveying land, for example. Pythagoras (c. 570– c. 495 BC) was a Greek polymath who appears to have travelled widely and studied in Egypt, and (probably) Babylon, and (possibly) India before settling down in the Greek colony of Croton(a) in southern Italy. He formed a society of scholars there as a social/political/academic community. He was almost certainly aware of the theorem from his studies in Egypt (and possibly Babylon) but it is named after him because he appears to have been the first to prove it geometrically. His followers were also the first to discover one of its consequences … that there are numbers that cannot be written as fractions! But that is another story (see why √2 is irrational). What all the fuss was over was this: If you take any right-angled triangle and draw a square on each side, the area of the two smaller squares will always be exactly equal to the area of the largest square … provide the triangle is on a flat surface! This theorem led to great revolutions in our understanding of number and geometry, and it is of fundamental importance in many other branches of mathematics (e.g. trigonometry) as well. This is a theorem worth learning and knowing about! Most of the information that we have about Pythagoras (c.570–c.495 BC) was written centuries after his death. It is difficult to know with any certainty which accounts are true. He was born on the Greek island of Samos, in the eastern Aegean Sea, just off the coast of Turkey. 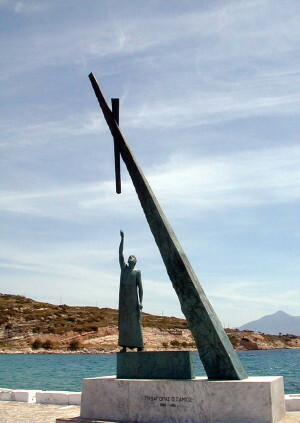 The image at left is of the monument erected in his honour in the harbour at Pythagoreio. It depicts him completing a right-angled triangle. His father, Mnesarchus, was a gem-engraver or a merchant who apparently travelled around the Mediterranean Sea by ship, trading and selling his wares. It is possible that his mother's name was Pythais (according to Apollonios of Tyana, a first century orator and writer). As a young adult, he apparently travelled to Egypt and Greece. He probably studied with the priests (the learned class) in Egypt and possibly met the great philosopher, scientist, mathematician, and engineer, Thales of Miletus. According to the Syrian philosopher, Iamblichus (ca. 245-325 AD), Pythagoras studied in Egypt for 22 years and learned as much as he could, especially in astronomy and geometry. He was then taken captive by Cambyses II's soldiers who took him to Babylon where he studied arithmetic and music etc. with the Magi for a further 12 years before returning to Samos at about 56 years of age. If this is true, he may have been in Babylon during the last years of the Jewish exile there. Some accounts have him travelling as far as India in his search for knowledge. He is supposed to have returned to Samos in 520 BC (two years after Cambyses died) at around 56 years of age. At about 530 BC, he moved to Croton, in the part of southern Italy known as Magna Graecia, where there were many Greek colonies. It was here that he quickly attained extensive influence and established some form of intellectual, religious, philosophical and political society based on an aesthetic lifestyle. To indicate some of the confusion about his life, Aristoxenus (b. c. 375, fl. 335 BC) claimed that Pythagoras was 40 years of age when he left Samos (and not 56 as Iamblichus claimed). According to some accounts Pythagoras married a native of Croton named Theano, and had children (there is mention of a son, Telauges, and three daughters, Damo, Arignote, and Myia). Myia was supposed to have married Milo of Croton a follower of Pythagoras and reputedly the strongest historical Greek that lived in ancient times. I have written of Milo elsewhere (see my story of Chocolate and Mathematics). Towards the end of Pythagoras' life, a significant conflict developed between Croton and another town, Sybaris, to the north west. Even though the citizens of Croton won the battle, further conflicts developed in the region, much of it against the Pythagoreans. One major attack was made on a group of Pythagoreans, possibly in Milo's house. The building was set on fire and many perished. One account has Milo rescuing Pythagoras from the burning building. The Pythagorean 'brotherhood' quickly ceased to exist. Pythagoras left no texts but many mathematical and scientific discoveries have been attributed to him in the fields of mathematics, music, astronomy and medicine. More precisely, these discoveries have been attributed to the Pythagoreans, so it is not known how many could be personally ascribed to Pythagoras himself! It has been claimed that he was the first man to call himself a philosopher (a lover of wisdom). Almost certainly, Pythagorean ideas greatly influenced Plato (428/427 or 424/423-348/347 BC) and through him, all of Western philosophy. Although we know this theorem as Pythagoras' Theorem, the earliest writings connecting the theorem with his name date from five centuries after his death (in the writings of Cicero and Plutarch)! It was only in the fourth century AD, some 800 years after Pythagoras lived, that he was commonly given credit for discovering his theorem. It is said that he or his students were possibly the first to actually prove the theorem, although the Babylonians had very sophisticated knowledge of it (sufficient to suggest that they possibly had a proof of their own). There is no doubt that the Pythagoreans regarded order in nature, and its links with number, with considerable awe. Plato's student, Aristotle, wrote in his Metaphysics 1–5 , cc. 350 BC, The so-called Pythagoreans, who were the first to take up mathematics, not only advanced this subject, but saturated with it, they fancied that the principles of mathematics were the principles of all things. It is thought that the Pythagoreans were the first to discover the harmonies of strings with lengths in particular ratios. In particular, it is said that they observed that the comparitive string lengths (when of the same material and tension) of the E, B and G strings of the cithara were in the ratio of 3:4:5. 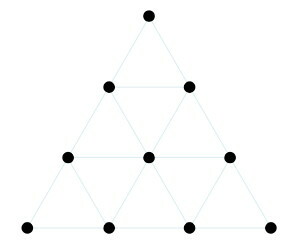 It has also been claimed that Pythagoras was fascinated by the tetractys, a triangular arrangement of ten objects as shown at right. Ten was considered a perfect number and, as a mystical symbol, the tetractys was very important to the Pythagoreans. Iamblichus reports that they would swear oaths by it. Euclid (of Alexandria, fl.c. 300 BC) lived about 200 years after Pythagoras. He studied and taught in Alexandria at the time of Ptolemy I Soter who was the first Greek pharaoh of Egypt (from 323 to 285 BC). The Macedonian/Greek empire has split up after the death of Alexander the Great in 323 BC and four of his generals 'divided the spoils.' Ptolemy assumed control of Egypt and began a successful dynasty that included Cleopatra (who was therefore, by the way, of Macedonian Greek heritage). 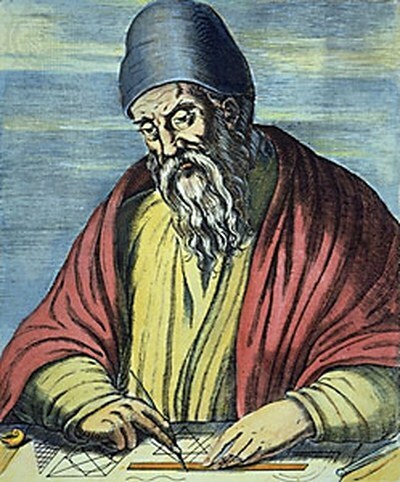 Euclid was also Greek and lived in an environment that valued knowledge and research. Either Ptolemy I or his son, Ptolemy II, was responsible for establishing the Library of Alexandria and Euclid's name is one of the first to be associated with that centre for learning. Sadly, very little is known about his life. You may read a little about him at the Encyclopedia Britannica site or on Wikipedia. Euclid's proof of the Pythagorean theorem is contained in Proposition 47 of Book 1 of the Elements. The medieval nickname for it was the Dulcarnon (from the Arabic for "the one with two horns"), because the corresponding diagram looks a bit like a head with two horns sticking out of it. It has also been called the bride's chair, and you will find other names, and lots more, if you read Alex Bogomolny's articles (Bride's Chair and Desargues in the Bride's Chair) on his excellent Cut-the-Knot site. Pythagoras' Theorem is used in many branches of mathematics and is possibly the most proved theorem in mathematics! Elisha Scott Loomis identified over 350 of them in his classic work, The Pythagorean Proposition, which he published in 1928 and again in 1940. I recommend that you learn an algebraic proof and a geometric proof! 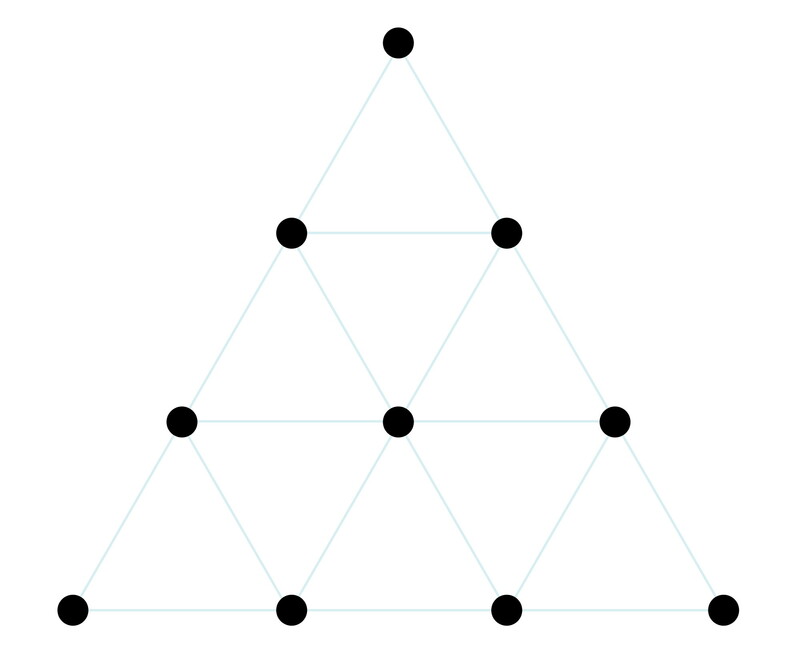 You will find a very interesting discussion of preferred proofs of Pythagoras' Theorem on the Quora site under the title What is Your Favorite Proof of the Pythagorean Theorem? I have not yet added resources to help you practise the use of Pythagoras' Theorem. Textbooks abound in these anyway. Just remember to set time aside so you can concentrate on your learning! Intensively practise deriving and using the formula for a few days, and then use your diary to plan a time to revisit the topic and refresh your memory. That is all you need to learn and master this very useful theorem. Raymond Merrill Smullyan has written of an experience he had while teaching Pythagoras' Theorem. He drew the classic diagram, and asked his class to decide which was larger, the sum of the areas of the two small squares, or the area of the large square. He reports that about half the class chose each option. What was interesting, and of value to a teacher, was his observation that both groups were amazed when they were told that both were of the same value, i.e. that there was no difference. Amazement is a wonderful motivator in any learning situation.